April can been cold and rainy, but I know that Spring is here because the gardens are lit up by swamp lanterns. The more common name for these beautiful plants, of course, is skunk cabbage. In March, April and May the cadmium yellow flowers thrust up from the wettest places in the forest. The name implies a noxious smell but I think this is because of its similarity to another plant, also called skunk cabbage. The other skunk cabbage, Symplocarpus foetidus, grows in eastern North America and Europe. It does have a strong smell that has been described as a "rank, fetid, odiferous, putrid, vile, revolting, vomitous stench. Remember that our western skunk cabbage belongs to a different genus, and that it has a smell that is rich, musky, langorous and aphrodisiacal. This confusion due to common names puts me in the camp of those British romanticists who call our plant Swamp Lanterns. The yellow flowering Skunk Cabbage, Lysichitum americanum, is native to Clayoquot Sound, and appears in wet spots throughout the gardens. Look around the pond for some close relatives we have planted. Lysichitum camchatchensis, an Alaska native, is almost identical, but with white flowers. Some Calla lily hybrids have been planted to show how much variety ambitious hybridizers have introduced. We often view non-native plants as beautifully exotic additions to our gardens, so it should not surprise you that our under-appreciated Skunk Cabbage is appreciated in Europe as an ornamental garden plant, having been introduced into horticulture there in the early 1800s. Charles Darwin may have known the plant, and would have been fascinated by the subtle strategies the Araceae family has developed to attract pollinators. The European species, Symplocarpus, evolved a putrid smell to attract caprophagal (dung-eating) flies and beetles. The true callas have a sweet smell that attracts sugar-loving pollinators such as bees. Lysichitum seeks out the middle way with its complexly rich odors that attract both bees and beetles. The scents released change with the temperature throughout the day, corresponding to the kind of pollinator most likely to be roaming about at that time. This adaptation increases the likelihood of reproduction and makes our skunk cabbage a hardy competitor for a place on the rain forest floor. Swamp Lanterns also have a not so subtle, visual strategy for attracting pollinators. The large, brilliant, cadmium yellow spathe unfolds and envelopes the tumescent spadix in a frakly sexual clasp. The color is flourescent in its intensity and garishness and can be seen from hundreds of meters away, with the same effect on insect pollinators as a vinyl red miniskirt has on male Homo sapiens. 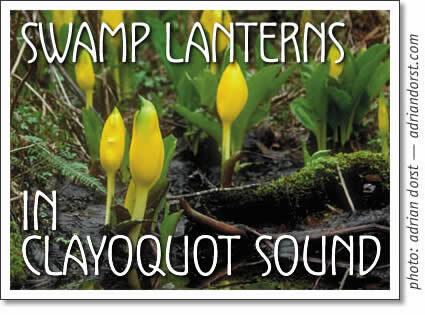 Enough botanical prattle, the Swamp Lanterns will be lit throughout Clayoquot Sound for the next two weeks. Enjoy them! George Patterson rules as the Supreme Director of the Tofino Botanical Gardens. Lysichitum americanum, the yellow flowering skunk cabbage - also known as skunk weed, or swamp lantern - is blooming in wet spots in Clayoquot Sound in April.